Question: How good is Arrogate and do you think he can beat California Chrome in the Breeders’ Cup Classic? Answer: I’ll let you know around the three-sixteenths pole. Its about time for his own thread. Looking at Arrogates pedigree brought me to Meadow Star. I don't have enough power right now in phone to look at MS pedigree. She`s a beautiful girl....you`ll like her. !,500,000. million dollor winner in the late eighties. I never had big hair; just big shoulder pads under sweaters, which, in retrospect, were pretty funny. Going up in an elavator in the 1980s, when I was a paralegal and worked in one of towers, got off of the 45th floor, and had a growth on the outside of my shoulder; one of those Velcro shoulder pads. So ugly, and nobody told me. When I found out; totally embarrassed as a young professional in my mid twenties. Major fashion faux pas in the day. Haha. After Chromes latest workout, I`m convinced there isnt a horse I know in America that he will not beat on BC day. He`s as strong as he`s ever been and am sure he`ll be better then the Pacific Classic. That was a huge race. I`m not knocking Frosted. He`s a horse that I regularly play and have been rewarded and disappointed as is the way in horse racing. i just dont think this is an ideal place for him or his trainer. So if I have decided that no known American can beat him, why do I feel a sense of foreboding? Could it be Found? Its my belief right now , that Aiden is playing to a particular race scenario. He thinks he see`s the same race shape that brought keen ice a grade 1 win, catching a tired and low oxygen American Pharo. Because the same fear had gripped me, I find it revealing. But who is going to provide the relentless fractions. Arrogate is an unknown. Lightly raced, yet coming off a performance that will be talked about for years. Its not like we havent seen those kind of performances before. Many oldtimers talk of some great races of the past that werent repeated, but there are a few from the near past. Constitution at gulfstream....social inclusion in that whatever, dang I cant remember the race. Both those races were careers. can Arrogate repeat that performance ? everyone wants to know. Can you see how low he gets, eating up ground...getting faster, getting lower...Thats a dude with heart and style. Theres a lot of work to do discovering this new shooter for chrome. Lots of old times spent with Unbridled, lots of time with Unbridleds Song. One thing they used to say....Pure talent?...like nothing ever seen...I`m going to have fun revisiting some of the old articles. Feel the day gone like it was today. If I find something fun I will share it with you. Thanks tincup, for your thoughts. How will found do on dirt?,who are the pacesetters? Are you going to the races, tincup? Truth ? I dont know. Lizzie wanted to buy tickets some time ago and I convinced her to stay here at the man cave for the races. The fact is, all the races are better on the screens then at the track, yet there`s nothing in the world like a huge race live. I`m conflicted. I`m starting to lean going. Yeah, the friday races are pretty exciting. Beholder is beautiful...Lizzie and I could almost touch her in the Pacific classic last year. Fascinating article about Arrogate and his missing teeth! 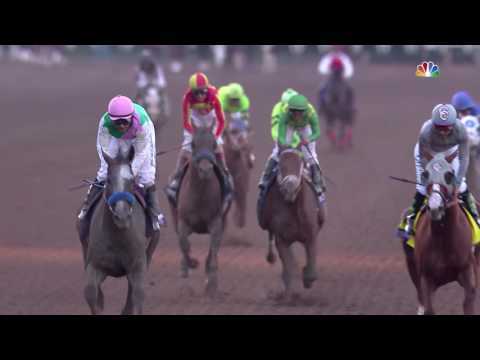 "Breeder's Cup Classic (gr. I) winner Arrogate came out of the race in good condition, trainer Bob Baffert said Nov. 6, the morning after the climactic end to the World Championships." Arrogate also looks like he might be headed for a rematch with California Chrome in the Pegasus World Cup. "With Arrogate’s scintillating victory over Horse of the Year California Chrome in the $6 million Breeders’ Cup Classic (gr. I) fresh in the minds of buyers, the dams of both horses are among the top horses to watch during Fasig-Tipton’s November sale." Arrogate runs down California Chrome in the final yards of the Breeders’ Cup Classic at Santa Anita Park on November 5, 2016.